Sam Dong’s back … just temporarily, and it’s safe to say him on that bus is intentional. Hmm, I wonder if this is a break-up bus scene (don’t hate me Hye Mi fans)? They look somber??? 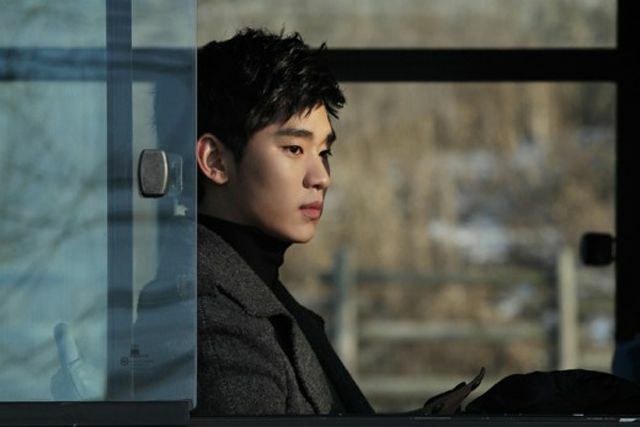 Catch Kim Soo Hyun‘s special appearance as top star Sam Dong on Dream High 2‘s premiere date, January 30th. Update: SHOUT OUT TO ANI! Thanks, Ani, for clarifying things 🙂 So, the bus scene is a meta of sorts. It’s for a drama or a movie in which Sam Dong and Rian (Jiyeon) are starring. They are reenacting that famous moment in Dream High: Sam Dong’s farewell with Hye Mi, this time played by Rian. I saw a preview of this scene, he’s filming a movie or drama with Ji Yeon playing the part of Hye Mi ! And I won’t hate you unni! But … please please please please please drama, don’t let it be a break up scene between them. At least make it so that um… they’re teasing the relationship between the famous “K” and his lover, so they’re making a movie about it? Ah I don’t know~ hehehehe. My mind is coming up with every other possibility that is not Jiyeon and Soohyun being a couple :S….. I really think it’s part of the character xD not some NG scene, you know ?